The machine is able to harvest energy with rated power of 250 – 1000 kW according to the speed of the water current on a choosing site. The machine is located between the surface and the bottom floor of a ocean at the desired depth (from 20 to 60 m), aligning itself to the current independently from its direction. 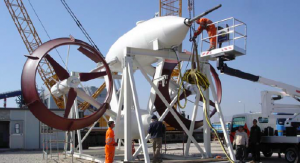 Blue Shark is a tidal-ocean current energy conversion system using two horizontal axis hydro turbine mounted on the side of a supporting submersed structure. The system is supported by the buoyant structure of the device and is tethered to the seabed with a mooring rope. Two asynchronous generators are installed on board and mounted on the turbines shafts through a gearbox. Each generator is electrically controlled by inverters, both for grid connection purposes and in order to reach optimal working conditions at different current speed. The power connection is provided through a power cable, passing along the mooring rope and extended until the shore grid connection point. 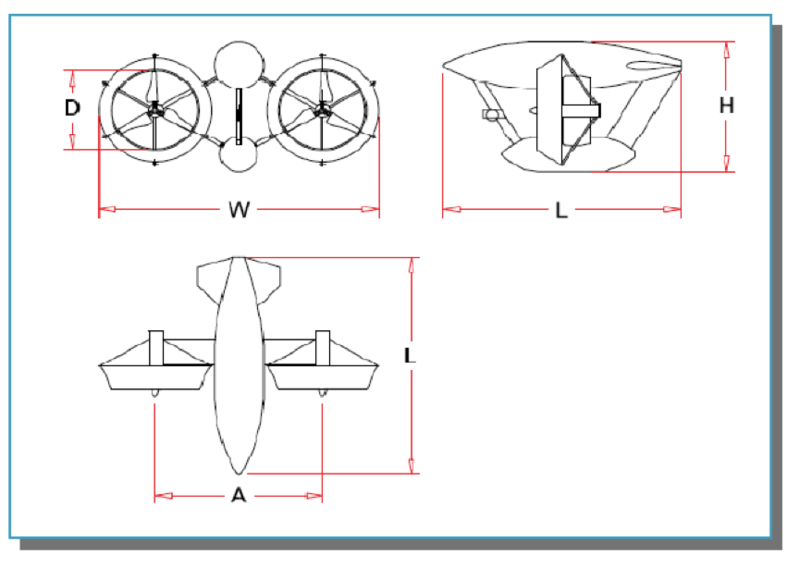 The 3 bladed turbines have been developed and designed in order to reach a high efficiency in a relatively large operating conditions range, using a properly designed airfoil section shape. A diffuser is placed around each turbine and allows an enhancement of the energy conversion process, increasing the mass flowing though the turbine swept area. One of the major feature of the system is the self orientation ability, particularly useful in reversing current, such as tidal cycle. During operations, the effective working depth and system direction vary with current stream speed and direction as a consequence of the balance among the thrust acting on the turbines, the hydrodynamic drag forces and the buoyancy force acting on the system. In a current stream of 4,2 knots (2,16 m/s) Blue Shark output is 250 kW. Otherwise a speed of 5,7 knots (2,9 m/s) Blue Shark output is 600 kW. • Blue Shark is not depth limited and maximises energy capture from a wide range of sites, including those with high tidal ranges and off-axis currents. • A variety of anchor types can be used depending on the seabed conditions. Moored solutions have a reduced drag compared to fixed structures, enabling the use of smaller gravity anchors. For a rocky seabed, common at tidal sites, pin piles (which require 10 x less rock to be excavated), rock bolts or tendon ground anchors can be utilised. • No heavy lifts are required, as Blue Shark can be towed to and from site, therefore much smaller vessels can be used for all operations. • Man access can be gained to the power electronics and control systems on the surface, either at the site or once Blue Shark has been towed in to a sheltered location.